Martin Luther King Jr.’s “I have a dream” speech changed the world. He showed us that dreams have tremendous power, and eventually, all dreams fueled by faith, passion, patience and persistence come to fruition. 1) Dreams give us vision. Our dreams can take us from chaos to clarity, and eventually to concept. Keep a dream journal to start understanding the language of your unconscious. Look for recurring symbols that may offer a meaningful perspective on an issue you may be struggling with. After a night filled with vivid dreams, jot or doodle down as many images or thoughts you can remember. Symbols may emerge as guides in your daily life, as well as creative allies, leading to self-realization and fulfillment. 2) Dreams can bring direction to our detours. We’ve all had things in life that haven’t worked out as we planned — a breakup, a breakdown, a loss, a setback — everyone deals with “detours” in their path. A detour is many things — unexpected, a nuisance, difficult, hard to grapple with, frustrating — but it can be beautiful. When the road looks like a dead-end, our dreams can create new pathways for us to travel along. Dreams help us find the beauty in “not knowing” by bringing images and sensations into our awareness that we might not be able to grasp onto ourselves, when trying to navigate our detoured route. Dreams have the power turn our “detours” in life into everyday blessings. 4) Dreams fuel the fierce drive to bring our passion into the world. Dreams come from our innermost desires. They tell us not necessarily how we’ll get there, but why we need to get there. Once we have the “why”, the “how” will work itself out. All we need is that fierce conviction that can only come from dreams to act as our compass. Keep dreaming — Remember: Martin Luther King Jr. once gave a riveting “I have a dream” speech. It was NOT the “I have a plan” speech! How can it create the world of your dreams? 5) Dreams remind us who we are. Our dreams are the seeds that God plans for us, where our intuition whispers to us, and where we can find an anchor to our place in the world — even if we are “displaced” from it. In our dreams, we can find our way back home. After almost losing my own life, my dreams are now my safe place, where I can mingle with myself and with God. They are my Velcro to the universe and an ever-flowing fountain of faith, replenishing my trust in life whenever circumstances may make me afraid. Dreams dreamed me back into life. Faith is believing, without proof that something exists or that something will happen. Faith is the key that unlocks the treasure chest God has placed inside each and every one of us, the key that unlocks the doors to endless opportunities. It takes faith to believe in even the most unproven things. Nothing in life can be achieved without first having the faith and belief that you can. The bible says without faith it is impossible to please God. He has given us all that we need to accomplish all that he desires for and from us. No matter what obstacles life may place before you, faith gives you the motivation to take that first step….even when you don’t see the whole staircase. It takes a lot of courage to pursue your goals and dreams. Sometimes that path forward will be unclear and paved with many unknowns. This is where the importance of having faith comes in. We must have faith that the universe will place the necessary steps for our goals and dreams in front of us along the way. This belief can give us the courage to start taking action, and you can’t manifest all that you desire without action. Have the courage to simply begin. Embrace the journey and the unknown, practice faith, take consistent action and don’t quit! Next to each item on your list, write down what the first step (or two, if you can see that far up the staircase) is or what action it involves. How difficult was that? As long as you know where the staircase will take you, and where the first step is, it shouldn’t be too difficult, if you faith. Select one of your staircases, and get ready to climb. Look at what you wrote down for the first step in this staircase. Are there smaller steps within that step, or are there preparations you need to make before you start? Take a moment and think about that, and write down anything that comes to mind. Now that you know what you’re doing and have an idea what steps are involved, the last two things are to do what research you need to do (presuming there are things you think you should know before starting up the staircase), and to actually take that first step. Once you have taken the first step, feel free to repeat the process on paper for as many steps as it takes to become familiar with the process. Eventually, you will simply do them, because they will have become part of you and how you operate. From time to time, things will go wrong. You will falter, you may even fall. But with faith in yourself, faith in the presence of the staircase, and faith in the next stair, and faith in God you will get there. And the journey is half the fun, isn’t it? ” I have decided to stick with love. 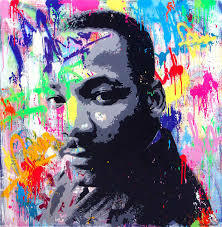 Hate is too great a burden to bear.” Martin Luther King Jr. Hate built up over time can and will become toxic. Toxicity over time can and will consume us and we too will become toxic. We can rid ourselves of the toxicity of hate, but only if we are willing to do so. Yes, it is true, we are not always treated fairly, we are not always treated with respect, in fact, we may have been mistreated, sometimes by the people whom we least expect, even by the very ones who are closest to us and are supposed to love us. As a result, we may feel justified in holding grudges, disliking…a lot, even hating; however, in doing so we are ultimately harming ourselves because this will become a cancer and in holding on to it we allow it to grow and fester, and ultimately it changes who we are. We then become full of anger and hate…just like the very person who we felt had wronged us. The Bible says in Matthew 5:44 that we should love our enemies. We should bless those who curse us, do good to those who hate us, and pray for those who spitefully use us and persecute us. We must learn to forgive. To love is to forgive and love is the most precious gift given to us. We can choose to stick with love by inviting that place within us where God dwells to take over. And recognize that God is love. Let us all do a little soul searching today; if you find any sense of hate, lingering in the corners of your mind, and we know that it can disguise itself quite well, shine the light of love on it and watch it disappear. After all, darkness cannot exist in the presence of light. Hate can only exist in the darkness and where there is a sense of separation from God, who is the Light. Although you cannot make anyone love you, they cannot make you hate them. It is a conscious decision and we have the knowledge, freedom and willpower to make that choice. Yes, I, too, have decided to stick with love…How about you??? Thank you, Martin Luther King Jr., for inspiring faith, dreams, love and all the power they hold for our world. The greatest gift we can give to each other is little steps in faith, trust, compassion, and bringing our dreams to light. This entry was posted in Faith, Inspiration, Motivation, Nourishment, Reflections and tagged Martin Luther King Jr. Bookmark the permalink.